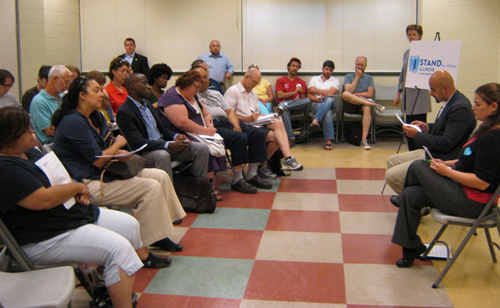 Fewer than 30 people attended Stand for Children’s so-called “Community conversation regarding the contract negotiations of Chicago Public School teachers” on Monday night, June 25, 2012, at the Fosco Park Fieldhouse in Chicago's Pilsen community. Chicago teachers and parents sit and listen while representatives of Chicago's Stand for Children office try and explain their current position on Chicago school negotiations at the June 25 "community conversation." On the right in the above photograph are the current Stand for Children leaders in Illinois, left to right, Mary Anderson (half hidden behind the stand chart), Juan Jose Gonzalez (shaved head), and Jessica Handy. Substance photo by David R. Stone.In a one-sided conversation, two paid Stand for Children staff members, Juan Jose Gonzalez and Jessica Handy, did the talking, then tried to control questions and answer through the standard "write down your question" method even thought the group was small enough for direct questions. A number of those who attended the "conversation" (including this reporter) were CTU members who are members of the Caucus of Rank and File Educators (CORE), a caucus of the Chicago Teachers Union. Gonzalez and Handy described what their organization saw as the current situation in the ongoing contract negotiations between the Chicago Teachers Union and the Chicago Board of Education. They also presented background information on how SB7 (a state law endorsed and partly written by Stand for Children and passed by the Illinois General Assembly in 2011) works. The Stand for Children representatives admitted that the law was designed to limit CTU’s ability to strike so that the Chicago Board of Education could impose changes such as a longer school day. Following their presentations, the staffers (Juan Jose Gonzalez, who heads Stand’s Chicago office, and Jessica Handy, Stand’s lobbyist to the state legislature in Springfield) answered written questions from the audience. The audience, dominated by members and supporters of the Chicago Teachers Union, asked questions designed to show Stand for Children’s bias against unionized teachers. For example, Stand for Children tries to portray itself as even-handedly pushing both sides to negotiate to avoid a strike. So why, one of the questions asked, is Stand for Children circulating a petition “calling on both sides to get back to the table” — when the union has never left the table since negotiations began and Board CEO Jean Claude Brizard has never attended the negotiations? By my count there were five people who were not unionists or union supporters. They would have been so lonely had we not shown up!